Notes: Folded book, Location in Book Room;Includes table of mining leases; drawn in Pretoria, engraved in London, published in Johannesburg; This is the larger edition of 1889, Derived from the 1st edition dated 1878 see Map # 902; see book 2115 RGS extract; In 1835 to 1837 the Great Trek led thousands of the Dutch decendents or Boers from the British controlled Cape Colony to lands north and east of the Orange River, and then further across the Vaal River. There they established the Transvaal, which was recognized as independent by the British in 1852. The lands south of the Vaal River became the independent Orange Free State two years later. In 1871 , Kimberly was founded and became the center of the diamond industry in Griqualand West, which had been ruled by a Griqua chief under authority of the Orange Free State. Shortly thereafter, the British annexed Griqualand West, despite protests of the Boers. In 1877 , despite a treaty granting its independence, the Transvaal was also annexed by the British. In 1880 to 1881, this led to a revolt by the Boers and the Treaty of Pretoria granting them their freedom. 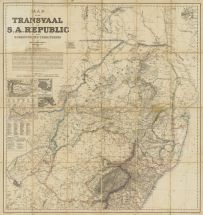 This map shows the Transvaal, Orange Free State and Griqualand West during the period of this turmoil. The conflict between the British and Boers was not settled until the Boer War of 1899 to 1902. This Map # 1466 published in Johannesburg by G.A. Troye is a larger edition, d.1889 124x128 cm, on 24 panels each measuring 20x32cm, mounted on canvas. This important map is the first major map to show the name Johannesburg, and incorporates vignette maps including the Witwatersrand and De Kaap Goldfields, including an index of mining leases. [An extra index appeared in other editions providing a complete listing of all the farms in the South African Republic at the outbreak of the Boer war, and as such forms a unique reference, the Marriott index]. See also the third version, (map #1464) Pretoria, S. A. Republic 1899, set of the 6 sheets on linen, Scale 1:476,000 Lithographed by Wurster Randegger & Cie (J. Schlumpf) Winterthur Switzerland, published by Edward Stanford, London, 1899; On this larger edition, the other contributors are added in the legend as follows: The central and eastern portion of the Republic is compiled from general plans and the Surveyors general's Office kindly placed at the disposal of the compiler by Johann Rissik esq. Assistent Suryeror General, and from diagrams reduced by the compiler. The northern districts from surveys and sketches furnished by Messrs. F. Rissik and M. C. Vos, B. A. the western boundary from the map of Bechuanaland compiled in the War Office, March 1886, partly amended by the survey of Mr. Devenish. The Vaal River boundary is laid down according to a compilation from Surveys, and the Boundary Line between the Orange Free State and Natal according to the survey of Colonel Hime, R. E., C. M. G. and Mr. Surveyor Vos kindly furnished by J. C. Fleck esq. Surveyor General of the Orange Free State. The northern portion of the district Harrismith is reduced from general plans furnished by Mr. Surveyor C Pritchard, the other Districts of the Free State from Robinson's Map compiled 1882. Natal according to Sutherlands Map, corrected by Trigonometrical Survey of Capt. Morris, some of the results of which were kindly supplied to the Compiler by the Astronomer Royal, Cape Town. Griqualand West is reduced from the Map compiled in the Surveyor General's Office Cape Town. 1883, kindly furnished by S. Melvill esq. Assistant Surveyor General of the Cape Colony. Bechuanaland is reduced from the beforementioned Map obtained by the Compiler through the kind intervention of the Right Hon. Lord Wolseley, G. C. B. Basuto Land is compiled from the proof copy of the Latest Map supplied by G. Y. Lagden. Assistant Magistrate Maseru, Basuto Land. The Delagoa Railway Survey and portion of Line open to Lebombo has been inserted from Maps kindly furnished by Colonel J. Machado, of the Royal Portug. Engineers. of the numerous sketch maps and Itineraries furnished by Travellers and Others use in the Compilation, space permits to mention those only furnished by John Scott, esq. of Gala, and John Ballot esq. of Rolfontein. The compiler is also greatly indebted to Capt. James Hoggan, Forbes Reef Zwaziland, for his astronomical observation and information regarding Zwaziland.